There is a sign at each end of this narrow road section for work to happen on the road, no "Caution Cyclists Merging" and no speed restrictions. 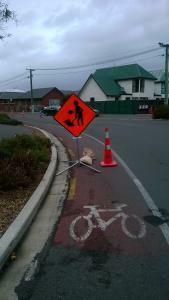 The signs are both placed blocking the cycle lane, forcing cyclists into the path of cars. There is garden/grass alongside the signs where they could be placed safely.